It has been another very lengthy absence for me but this was partly because I was away in Japan for two weeks which was unbelievable. Sadly when I cam back I barely had a moment to myself as I was working nights and then doing teaching on my days off. Now that I finally have some days off, and I’m not feeling like a zombie, I wanted to share this new (yet old) recipe with you that I hadn’t made in years, until now! The original recipe came from a One Pot Cooking recipe posted in Men’s Health several years ago. 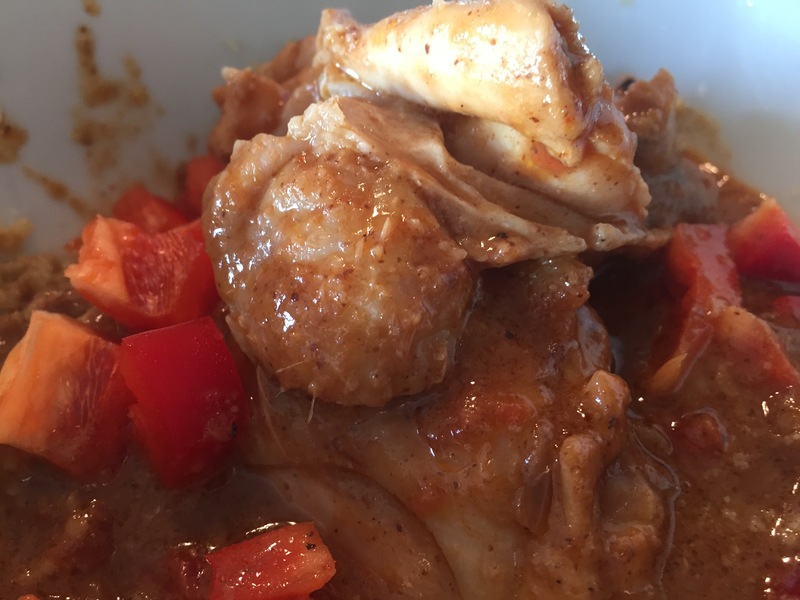 It is originally designed to be made with peanut butter (original title of chicken and peanuts stew) but to make it paleo I substituted peanut for almond butter and it’s just as delicious. I will warn you though this dish is very moorish, I have to restrain myself from eating the whole pot sometimes, try it and I hope you’ll see why. For best results I find that on the bone chicken thighs, skin on, gives the best flavour and texture to the stew however for shift workers I would advise you use boned and skinless as trying to eat it on the bone in your short meal break window isn’t the easiest thing to do. Additionally make sure the almond butter is pure almond butter, no hidden nasties and if you can gets roasted almond butter it will taste just like peanut butter. As the name suggests it is all cooked in one pot on the stove which means less washing up. Unlike some of my recipes this can’t really be made before a shift. Like all stews and casseroles, the flavour improves the next day and even the day after, but make sure you store it in the fridge, though you can freeze it in portions should you have the restraint to make it last that long. Put the chicken thighs in a bowl, add a small amount of olive oil and a generous amount of pepper and salt to season the meat well. Heat around 4-5 tbsp of olive oil in a large saucepan/pot and brown the chicken thighs over a high heat until they are turning brown on top, you don’t want to cook the thighs completely. Once the thighs are cooked place in a clean bowl and cover with tin foil. Fry the onions in the remaining oil until soft, there should be quite a bit of oil left. 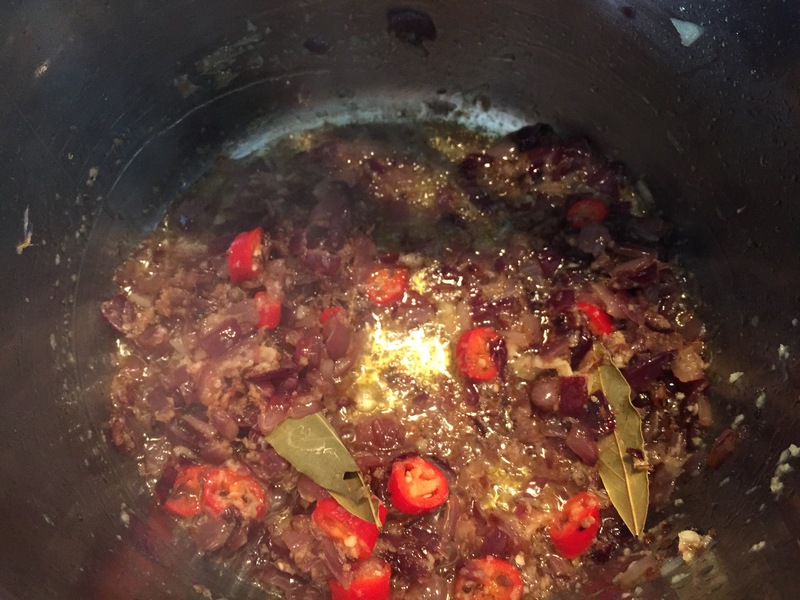 Once they’re cooked add the garlic, ginger, chilli and bay leaves and cook for a further minute or two. Remove the pan from the heat and add the tinned tomatoes, chicken stock, almond butter and paprika. Combine and then add the chicken thighs, making sure you get all the juices in the bowl out. Stir and then return to a medium heat and cook for at least 40 minutes, stirring regularly to ensure the sauce doesn’t burn on the bottom. Once cooked through serve on a bed of cauliflower rice with some freshly steamed vegetables or green salad and enjoy!